Last fall, when Nielsen asked U.S. consumers which smartphone they would buy next, the Apple iPhone was at the top of the list named by a third of the respondents. Android trailed having been named by 26% as their next smartphone. Now, it's a mere half year later and 31% of those responding said that their next smartphone would be an Android flavored model which beats out the Apple iPhone's 30% response by a hair. 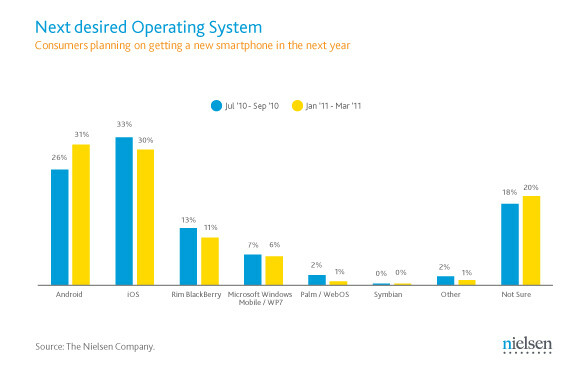 BlackBerry comes next with 11% of the total while 20% have no idea yet which model they will purchase next. And that bring us to the bottom line. Of all smartphone users in the U.S., the Android OS had the largest marketshare as of March 11th with a 37% slice of the pie. The Apple iOS scored a 27% share which beat out third place BlackBerry by a mere 5%. 10% of the U.S. smartphone market belonged to Windows Phone 7 as of last month while Palm and Symbian brought up the rear with 3% and 2% of the market respectively. So what will we see in the next survey due in September? Will Android pull away and expand on their thin lead or will the Apple iPhone reverse momentum and leapfrog Android? You never know. Perhaps a major surprise is waiting for us in September. Lol, I guess this is one article where Taco can't claim a "crushing defeat" against Android. *sits down and waits for the coming comment war* My prediction: Android pulls away. Poll: how many of you would read a webcomic starring personifications of all of the Smartphone OSes battling each other in a space or fantasy setting? I would read that, and save each edition!! 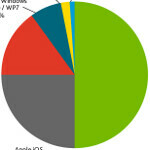 Android has more smartphone users, but iOS has more users overall if you count iPads and iPods. That's a more fair comparison since Android has multiple manufacturers and more carriers selling their phones. It's actually impressive that a company with a limited product line is outselling multiple companies on all carriers overall I'd say. So yes another victory for Apple and a pathetic hate filled life for you. not to be that ANDROID GUY but, duhhhhh..... i use to own a iphone and hated Android until i started using one, I must say its the best i have ever had...yeah it may have alot of live wallpaper apps and widgets but hey, iphone has alot of web page shortcut apps due to its lack of flash support. The thing with Android is you have way more devices than the iOS offers in smartphones. Apple can still have the top selling device (though Samsung is trying hard with their Galaxy S series) but with Android having numbers 2-30 they're gonna own more of the OS market share. Personally I love Android, I wouldn't get an iPhone as of now, they'd have to massively overhaul the OS for me. But for some people the iPhone is exactly what they want. Blackberry is so far behind the curve, there's no reason to have one unless you really need a basic smart phone or corporate email. Blackberry coasted by for years by being the best OS that Verizon offered. Once Android came out blackberry sales plummeted. Andtoy users dont realize this is in the U.S. Only market. 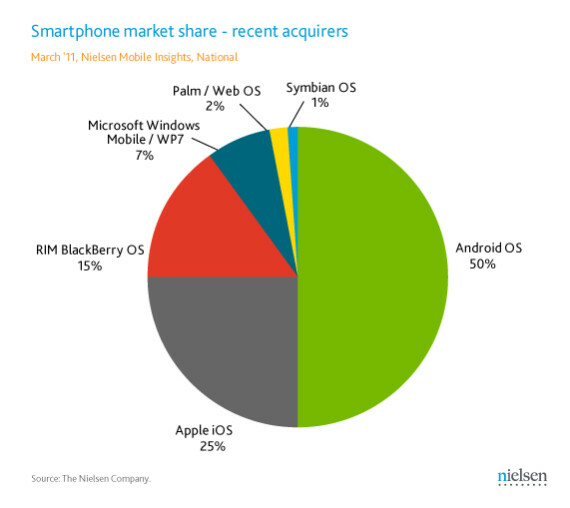 Put a global pie chart and you will see Symbian 1st QNX/Blackberry 2nd and IOS/Iphone 3rd. Other 4th Android 5th. And let's review one more fact that pops out from what I've posted above: Android is the ONLY OS to GAIN worldwide market share over the past year. sniggy got issues up his but xD i knew if i mentioned any OS was(technically is) better than android that u Andtoy fan boys would reply away, Ahahaha get a life, p.s. I wrote that to get under the skin of people like you. Dude you can be making way better use of your time. You made a point, you "proved" someone wrong with reports that aren't even yours. Congrats. You don't get a cookie or anything... Chill man. This is not to take sides on any phones btw... Nor is it to take sides on in the argument... Just overwhelmed by some people. *grins* It may make me pathetic, but arguing on the internet is one of my many hobbies. This is what I do when I'm bored. Ahahaha wanna know something funny. i didnt cite anything, its common knowlege dumb*ss! Symbian and QNX has been around longer than Andtoy thats why their bigger but!!! im not saying they will stay on top since IOS, Andtoy, WP7, Web Os is catching up. Apart from bungling which place Android fell in, you almost exactly quoted the study I linked. You're making yourself look like a fool, Luis. It's not common knowledge exactly what market shares each OS have. Even if it was, it's common knowledge as of a year ago. So either you haven't been paying attention for a year, or you're really dumb enough to lie when the evidence has been presented to you showing where you got your numbers from. you have any source to back up your comments? any chart you would like to share? any ideas where you getting your facts? if not then why I cant use Wikipedia to post my info? unless you have sources to back you up then you should stay shut ok? OH come on now! You can't be expecting an apple fan to post actual current facts and not spread FUD--what would their leader, Jobs, say if they started stating facts? I am an Android user and have converted a few people to the Android platform. Here is my warning to Google, stabalize your OS before WP7 gets any more foothold. Non-techy people want a phone that just works. people don't understand what to do when several force closes when they try to launch an app., locking up phones, and locking up on reboot, when using Android. The tech savy people are not a big enough comunity to suport an OS. Maybe they can lock down the system for the normal user and make it easy to unlock for people like us. I love Android but they are leaving a proverbial door open for the competition. well like i have been sayin over and over, little fanboys, eh emm...Long live android! The world's #1 mobile OS!! still love blackberry to though! Bold touch cometh! !